The ‘Occupy’ movement has now been going on for several months. Starting in the USA in September 2011 with Occupy Wall Street, Occupy actions have taken place in 100 US cities and, according to the Occupy Wall Street website, 1500 cities worldwide. 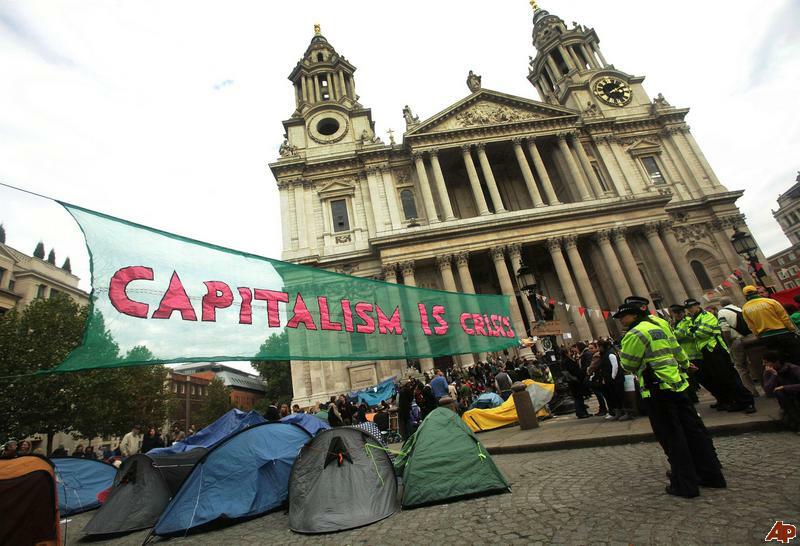 In the UK Occupy events have taken place in several cities such as Edinburgh, Bristol and most significantly the St Pauls occupation in London. On the face it, this may look like a timely and welcome response to the international crisis of capitalism; an avowedly non hierarchical, anti-capitalist, movement, seemingly attracting a considerable amount of public goodwill, if not direct support, not only right there in the heartlands of capitalism, but literally within spitting distance the centres of finance capital such as Wall Street and the City of London. So is this the beginning of the popular revolt against the capitalist system that revolutionaries have dreamed of for so long? 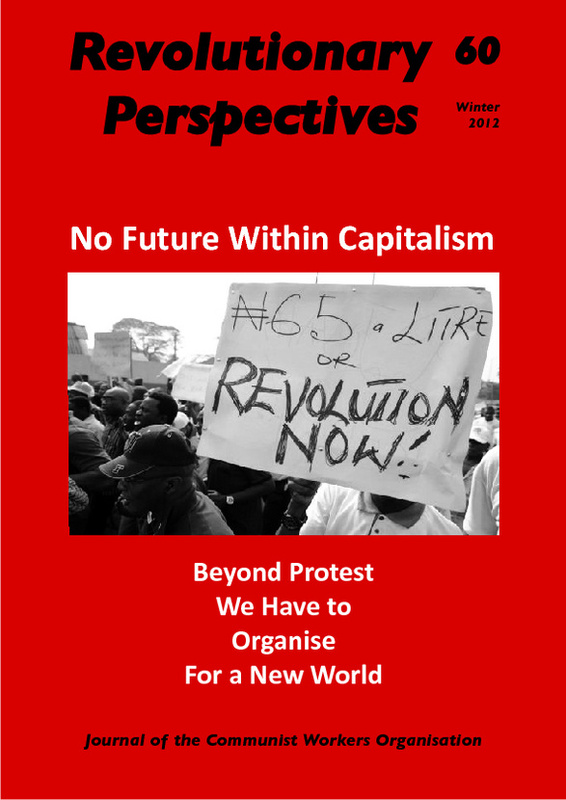 The Occupy movement claims to be anti capitalist, and there is something to be said for the Occupy camps that have given a platform to revolutionary organisations to speak and hold meetings. Elements of the St Pauls Occupation also gave support to striking electricians working on construction sites in the City, and discussions on the nature of capitalism abound at the ‘Tent City University’. At they same time they also give a platform to those advocating petty bourgeois nonsense such as seeking a ‘return to the land’ and people who rant against the consumption of alcohol like nineteenth century temperance fanatics. You are probably more likely to stumble across the inter-faith prayer tent than encounter a coherent discussion on the possibility of communism. In short just about anything (within the boundaries of political correctness) goes at these Occupy camps, which in truth have more of the feel of Haight Ashbury, (the San Francisco hippy Mecca of the late 1960s) rather than Petrograd in 1917. OWS is fighting back against the corrosive power of major banks and multinational corporations over the democratic process, and the role of Wall Street in creating an economic collapse that has caused the greatest recession in generations. The movement is inspired by popular uprisings in Egypt and Tunisia, and aims to fight back against the richest 1% of people that are writing the rules of an unfair global economy that is foreclosing on our future. This sort of reformist perspective to ‘democratise capitalism’ in line with groups like UK Uncut who think that capitalism could be fair if only the government made the bourgeoisie pay their taxes, seems to be as close as the Occupy movement gets to having any political perspective at all. Such demands for a fair and democratic capitalism are rooted in petty bourgeois utopianism and serve only to peddle illusions about what is possible under capitalism, illusions that the working class must dispel if it is ever to wage an effective struggle against capital. This brings us to the question of class. This is an issue that the Occupy movement chooses to gloss over, or perhaps even to deliberately obscure. Of course the inequality that exists in society is at the heart of what the Occupy movement opposes, but this is conceptualised in terms of the 1% of those that own and control the world’s wealth, compared to the 99% who don’t. This may be graphic representation of that inequality but it is just presented as a given, the consequence perhaps of the power of greedy bankers or megalomaniac multi-nationals. The fundamental point that capitalism is a class society based on the exploitation of the proletarian majority by the bourgeois minority is neatly overlooked, as this would undermine the Occupy movement’s utopian demands for a fair and democratic capitalism. Those who hold a Marxist understanding of the need for a revolutionary transformation of society led by the working class as the prime agent of change cannot realistically function under the Occupy umbrella for anything but the briefest period of time. This is not just a theoretical difference, but one that has practical consequences for the aims and tactics of the struggle against capitalism. The Occupy movement is an eclectic one that will embrace anyone who has any kind of grievance against the system as a whole or in part. They are happy to engage with priests and bishops (as shown at St Pauls), trade union bureaucrats or with representatives of capitalism’s left wing such as left leaning members of the Labour Party or the Democratic Party in the USA. On our website we have published an article about Occupy Atlanta which explains how the left sought to preserve the social peace by playing the race card and by claiming that any criticism of the black majority city council is racist. It is inevitable that these kind of diversionary tactics will prevail within the Occupy movement in the absence of any clearly defined class politics. The Occupy movement is a genuine expression of popular resentment against the increasing austerity being imposed on the working class against a backdrop of the seemingly limitless wealth of the bourgeoisie. It has posed, albeit in a confused way, but not answered, the question of an alternative to the capitalist system, which resonates well with an increasingly large sector of the population. To the extent that Occupy provides a space for revolutionary ideas and tactics to be discussed and developed, this is to be welcomed. However because of the lack of any clearly articulated class politics, the Occupy movement, if it survives the onslaught of the courts and the police, will remain at the level of irrelevant gesture politics dominated by the diversionary tactics of liberals and the left. Occupy may contain within it some potential for revolutionary development but for this to be realised militants have to articulate clear class politics, and this would inevitably mean going way beyond Occupy’s confused and limited vision.